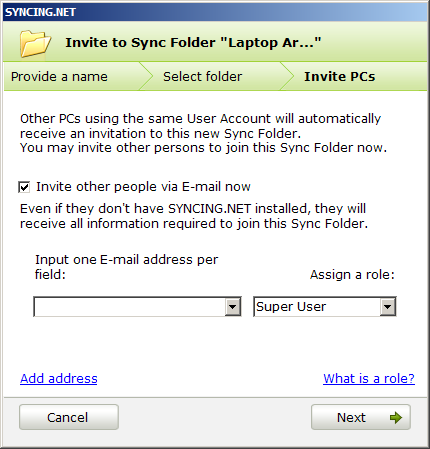 SYNCING.NET is a web based tool to synchronize files and Outlook data between Windows based PCs. Different versions are available for home, professional and office use. Very easy to setup. No VPN or changes to firewalls needed. No Mac, Linux or mobile support. SYNCING.NET enables data from multiple Windows PCs to be kept in perfect sync. As well as handling normal data files, it’s also an excellent option for sharing Outlook calendars and folders. It works over LAN and internet, and automatically connects with your other PCs without needing an IT expert to configure firewalls or VPN links. Installation was easy and network configuration automatic. However, the installation utility recommends closing Outlook before installing SYNCING.NET, which means you can’t really install the suite while people are working. Also, Outlook does not always close properly so installation is best handled by a reasonably IT savvy person. Roles control what other people can do with your data. In The Hypervisor Lab tests we installed SYNCING.NET onto two PCs, although it can be used with many more. With the suite installed on our first PC the next step was to tell the SYNCING.NET software our email address and choose a password. Having installed it on our second PC we then needed to enter the same email address and password so SYNCING.NET knew the two PCs were used by the same person. During each installation the setup wizard gave us the opportunity to select folders of files and Outlook data to be synchronized. As well as syncing with our own PCs, the Professional and Business versions also let you synchronize data with other people. For example, SYNCING.NET could be used to give colleagues access to your Outlook calendars and folders, as well as your normal folders of files. A wizard in the SYNCING.NET software makes this sharing process quick and simple, and a set of roles gave us quite a lot of control over what other people could do with our files. For example, people assigned the “User” role could add, edit and remove their own items, and a “Superuser” could also edit and remove other people’s data. Having answered a few questions the Sharing wizard sends an email with instructions and links for the other person to follow. Overall usability is excellent, but there’s only so much you can do to simplify syncing files between various computers. For example, things could get messy if someone setup synchronization on “folder1”, and then tried to separately synchronize a subfolder in “folder1”. In this scenario SYNCING.NET would not allow the subfolder to be separately synced. People could also run into problems if the same file is edited on two PCs at the same time. We tested this by opening the same Word document on two PCs and making a small change to each version of the file. Word appeared to be unaware that the file was being edited elsewhere and allowed the changes on both systems. However, SYNCING.NET seemed to intervene and rename the second version of the file: The result was two versions of the file saved in the same folder, each containing the appropriate changes. Things worked much better with changes to our Outlook calendar. In this case changes to the calendar were visible on our second PC a few seconds after they were made. When we added a calendar item to the same time and date slot on both PCs the result was simply two calendar entries shown side by side in the same calendar slot. In another test we found if we deleted a file from a folder that was being synchronized, the file would immediately be deleted from the other synchronized copies of that folder. While this is exactly what we would expect, we’d like to see a “delete confirmation” option to prevent data from being deleted on remote PCs by accident. Also, SYNCING.NET is not fully integrated into Windows Explorer’s context sensitive menus. It would be great if we could right click on a folder in Windows Explorer and add it to our SYNCING.NET setup. Unfortunately this is not possible in the current version, so we needed to launch the SYNCING.NET tool each time we wanted to add or remove a folder from our SYNCING.NET setup. If the two PCs are on the same subnet data is transferred directly between them without needing an intermediary. However, if one PC is disconnected from the network when a change is being made, the data would be encrypted and copied to a store and forward area on a SYNCING.NET server so it could be synchronized as soon as the other PC came back online. Each user can store and forward 200MB of data. We tested performance by putting a 325MB file into a folder that was being synchronized between our two PCs. It took about four minutes for SYNCING.NET to finish copying the file to the second PC over our WiFi network. Had our PCs been located in different parts of the world and connected only by the Internet it would have taken much longer. A free 30 day trial version is available here. This review was published on Wednesday, April 14th, 2010 at 7:15 pm. You can follow any responses to this review through the RSS 2.0 feed. Thanks for the review Roger, thought you made some great suggestions, particularly the delete confirmation. We have added this idea to our list for future feature updates. Also, thanks for flagging the outlook closing issue – we haven’t seen this during our own testing / use – will keep an eye out for it. The integration into Windows Explorer and improving duplicate resolution for files are features that are already on our roadmap. Stay tuned in a couple of weeks, we’ll be launching a new product.